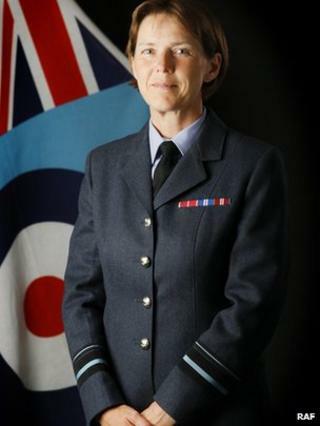 Image caption Air Vice-Marshal Elaine West said she takes up her new appointment with "enormous pride"
The RAF has appointed a woman to the rank of air vice-marshal, the most senior position to be held by a regular serving female in the UK armed forces. Elaine West, 51, joined the RAF straight from school and is married with a teenage son. The position is equivalent in rank to a major general in the Army or a rear admiral in the Royal Navy. The Army has had a female brigadier, while the Royal Navy has appointed a female commodore, but both of those are one-star ranks, whereas air vice marshal is a more senior two-star role. AVM West said she takes up her new appointment with "enormous pride". "I am privileged to have served in the RAF and to have enjoyed so many challenging roles over the years." She has served in 18 different roles on bases across the world, since joining the RAF as an aircraftswoman aged 17. She managed the final stage of the RAF's downsizing across north-west Europe, and oversaw the delivery of military accommodation in the UK. Married to a retired Tornado navigator, she has one son, who is 14 years old, the MoD said. She said: "To now be the first female military two-star is a truly unexpected bonus. "I know so many inspirational women across all three services who continue to make a substantial contribution to operations and our armed forces more widely. "This is a terrific opportunity and one that I'm looking forward to immensely." Chief of the Air Staff Air Chief Marshal Sir Andrew Pulford said her promotion was "thoroughly well deserved". Wishing her "every success in her challenging role", he added: "The vast majority of roles in the armed forces are open to women and I would encourage everyone, regardless of gender, to take full advantage of the opportunities available to them within the military." Mr Hammond said building the Future Force 2020 meant selecting the best and brightest talent from across the armed forces "irrespective of gender". He added: "I am pleased that we are demonstrating in defence that there are no 'glass ceilings' for female officers who have the necessary abilities to rise to the senior ranks." Women make up about 10% of armed forces personnel, or 14% of the air force, 9% of the navy and 8% of the army. Viewpoints: Should equal gender pay be enforced?